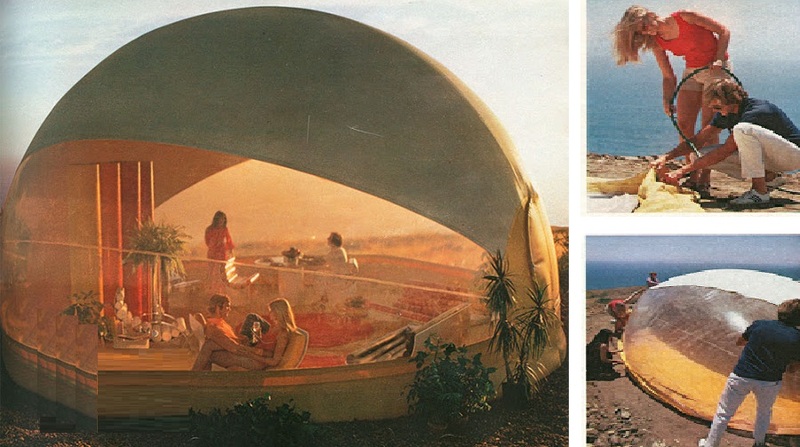 Some of you might be familiar with the bubble rooms that were popular last year — clear inflatable rooms you could buy for around 5K and set up in your yard or even camping as a sort of tent. Well, guess what? They actually tried this in the 70s, too. Yes, that era of creativity produced the idea as a rising product, featuring ads in magazines with young happy people setting up and inhabiting the tiny house bubble. The L.A. company behind it was called Chrysallis, and the ads put the bubble house in terms of the “most revolutionary concept in mobile living since somebody invented the trailer.” Well, you can’t really give the ad writer much credit for research, but I guess he didn’t worry too much about how the RV trailer was invented. The tiny house bubble fit into a 42 inch by 60 inch by 12 inch box when it was deflated and folded. When it was filled with air (which took about 8 minutes), the tiny building was almost 500 square feet (and was 25 feet in diameter). Of course, you had to keep pumping air into the bubble to keep it fully inflated, but the advertisers put this in terms of a constant gentle current of air swirling around the new house / building. It cost just under $2,000 in 1972 U.S. dollars. Previous Article You’ve Seen Tiny Houses … Now It’s a Tiny Personal Houseboat!